The RAF formation of Lancaster bombers during the fly past as seen by our cameraman who flew with them. The roar of the planes was heard all over the capital. 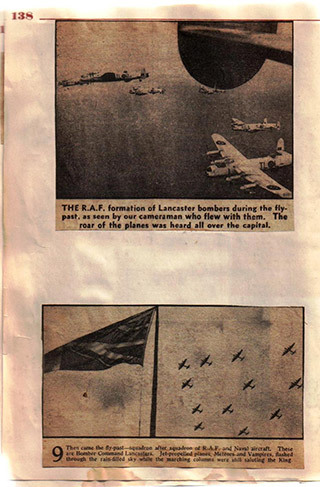 Then came the fly past – squadron after squadron of RAF and Naval aircraft. 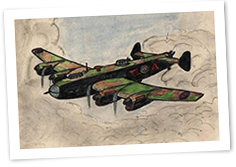 These are Bomber Command Lancasters. Jet propelled planes, Meteors and Vampires, flashed through the rain filled sky while the marching columns were still saluting the King.